December 25th: ‘Friends of Vrindavan’ celebrated the Christmas by organising a cleanliness drive around the ancient Govind Dev Temple. Shri Anuj Kumar Goswami, Sevait of Shri Radha Govind Temple invited the VCF drive to be organised in the temple premises and its surroundings. Shri Goswami said that the Sohni-seva is most humble seva of all the service dedicated to their Lordships of Shri Radha Govind ji. He justified the proverb of ‘Cleanliness is next to Godliness’ and insisted that the sanctity of the temple town can be maintained only through the action of the Vrindavan Cleaning Fund programme. Two mini-dumpers of garbage were cleared from the temple surrounding, after cleaning the streets and the drains of the Govind Ghera. 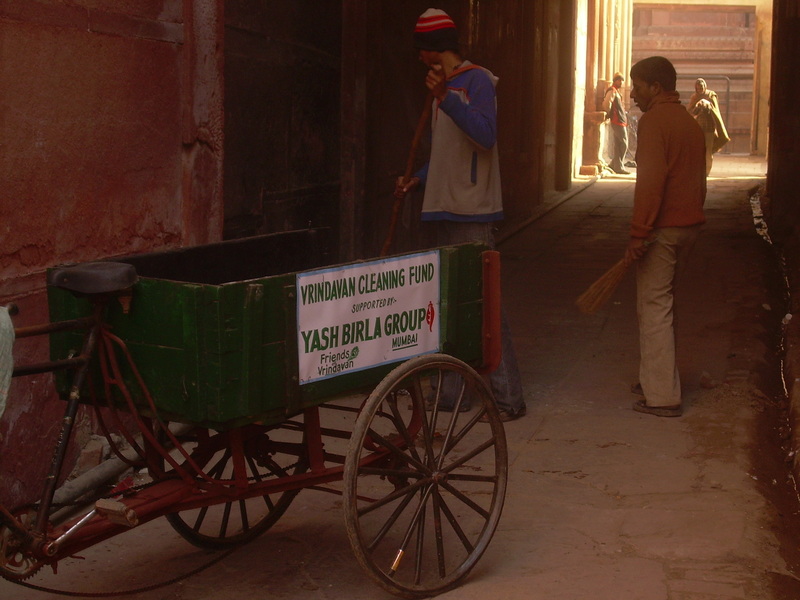 Shri Ram Narain Sharma (Brajwasi), Mahesh Chandra Sharma and Shri Swapan Kumar Goswami who reside in Govind Ghera said that the Vritt-wala, whose family has been traditionally cleaning the temple premises doesn’t regularly come to clean. They complained that he only comes to collect his monthly garbage collection fee, and doesn’t feel his responsibility to clean the temple premises and the residential complex around the temple.